Professor Hongyuan Dong gave two invited talks at Western Michigan University, Kalamazoo, MI. On January 15, 2015, Professor Dong delivered a public lecture at Western Michigan University. 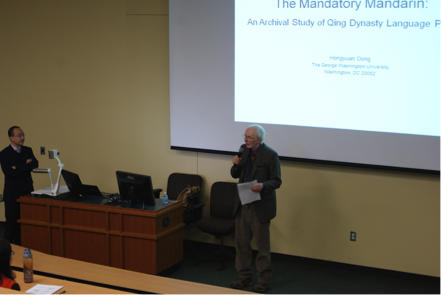 In this lecture he talked about the Mandarin Campaign and language policy in the mid-Qing Dynasty, based on his recent archival studies done at the First Historical Archives of China, in Beijing China, in summer 2014. He used memorials to the throne to construct a detailed description of the whole campaign and, arguing against major previous studies, he proposed different explanations as to why the campaign was not successful. The lecture was followed by lively discussions. The archival research is part of Professor Hongyuan Dong’s project on the linguistic nation-building in modern China, funded by the University Facilitating Funds. Professor Hongyuan Dong also gave a Brown-Bag talk at the Timothy Light Center for Chinese Studies, Western Michigan University, on January 16, 2015, in which he used new data to argue for different reconstructions of the pronunciation of certain words in Old Chinese. The talk also touched upon the use of historical reconstruction methods and the concept of recurrent sound patterns.